"Death to Smoochy" is the most juvenile, brainless excuse for a film to be released in recent memory. I could not bear the thought of rewarding this supposed comedy in any way; giving it a star rating at all would simply be too nice. For if, from the very first frame, a movie gives one the urge to stand up and throw something at the screen, there is something fundamentally wrong with it. Viewing "Death to Smoochy" is an experience not unlike being repeatedly hit in the face by a water balloon. If you must know, Robin Williams takes the name of kids' show host Rainbow Randolph, who gets arrested and thrown off the air for accepting bribes. After going through all of the possible replacements, Kidnet (the channel Randolph paraded around on) executives Nora Wells (Catherine Keener) and Marion Frank Stokes (Jon Stewart) grudgingly find one at the bottom of the barrel in Sheldon Mopes. His character, Smoochy, is a good hearted, healthy rhino made out of shoulder pads and duct tape. A deal is struck, and the new show "Smoochy's Magic Jungle" shoots to the top of the charts, much to the chagrin of Rainbow Randolph. Rainbow becomes obsessed with terrorizing Smoochy in any way he can, whether it be prank phone calls or sabotaging his show. Somehow, the mafia gets involved, conspiracies are unmasked, and the audience quickly loses their patience. "Death to Smoochy" is like a sick, twisted fantasy of a cynical four year old. When everyone else is watching Barney, a Power Ranger lover may want to do nothing less than destroy the purple one. Danny DeVito may not have had the Power Rangers or Barney as a kid, but he seems keen on the idea anyway. "Death to Smoochy" would like to think it is aiming high and taking risks, but how does one constitute cruel, tasteless, unfunny jokes for skilled filmmaking? Maybe I am being too harsh, but I implore you, where is the humor in seeing a man in a suit being beaten up endlessly? The film is devoid of anything at all good-hearted. Even the characters whose morals are supposedly intact are made to be purposely annoying. If one is going to satirize anything, one cannot just poke fun at. One must know the true nature of what their subject is in order to be able to exaggerate their humorous qualities. 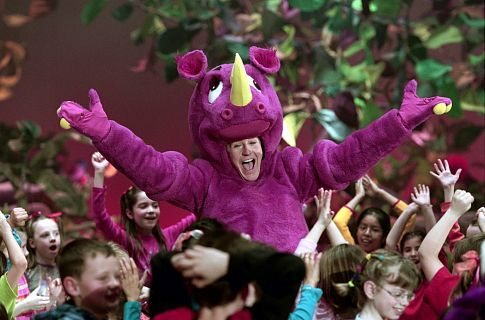 Obviously, no one involved with "Death to Smoochy" has ever seen a kids' TV show in their lives. These shows, in real life, are supposed to encourage the imagination of young children, not limit their minds to one warehouse-like soundstage. Smoochy's character is never convincing in the least bit. Rule number one in being a magical character on an educational kids' show: never take off your mask in front of the kids. Rule number two: NEVER take off your mask in front of the kids! You have to give the kids something to believe in, not show them that everything is a special effect. But why am I wasting your valuable time nitpicking over something that has no basis in reality whatsoever? One optimistic message does come out of "Death to Smoochy": for all the people who made an effort to create this miserable wreck, it can't get any worse. You will never see a more wasted looking Edward Norton, a more loathsome performance from Robin Williams, or a more shallow offering from Catherine Keener. For those people and everyone else on the "Smoochy" team, it's all uphill from here. In the end, "Death to Smoochy" only ends up making fun of itself. For example, for a film that seems happy to point out how evil the TV industry is for endorsing promotional tie-ins, it is interesting that the final shot of the film is a 360-degree view of Times Square inserted to squeeze in every last advertisement possible. When I left the theater, "Death to Smoochy" had me at the end of my rope; all I could say about it is that it was an awful, awful film in a hostile way. It is a waste of money, celluloid and human energy. It has been said that Hollywood is America's ambassador to the rest of the world, that the films we send to foreign countries affect their view of us. If this is indeed true, it is films like "Death to Smoochy" that make me fear for our future. "Death to Smoochy" is rated R for language and sexual references.